NASA recently added a whopping 219 potential planets to its increasing number of known worlds outside of our solar system. Of the new batch, it is believed there are 10 Earth-like planets, consisting of temperate, rocky worlds. One such planet, called KOI 7711.01, shows the most similarities to Earth. The potential planet is only 30% larger than Earth, and orbits a star like our own sun that’s 1,700 light-years away. It lives in the region around its star, too, meaning it may get enough solar warmth for liquid water to exist on its surface. “It gets approximately the same amount of heat that we get from our own star,” explained the SETI Institute’s Susan Thompson, who is part of the team discovering the new worlds. KOI 7711.01 was discovered via NASA’s Kepler space telescope, and is part of the final compilation of four years of Kepler observations, in which 4,034 possible planets from a small patch of sky were discovered, 2,335 of which have been confirmed. 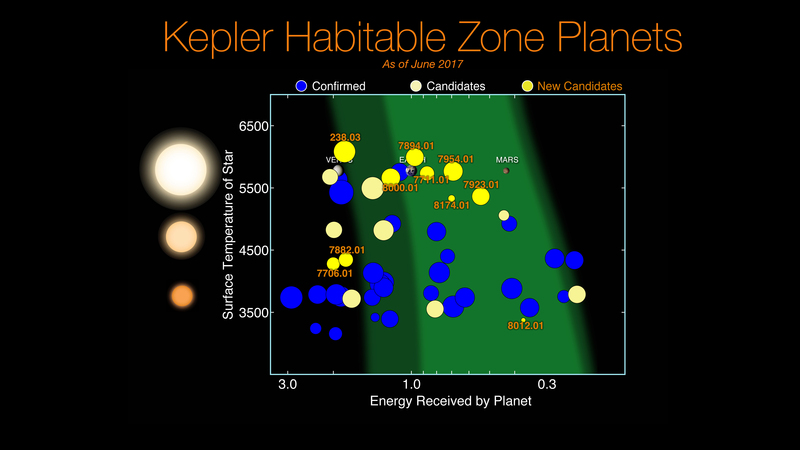 “Most of the planets found by Kepler are smaller than Neptune, and Kepler really, truly has opened up our eyes to the existence of these small, terrestrial-size worlds,” said Thompson. The catalogue of observations has given scientists enough information to begin practicing exoplanetary demography, which refers to the observation of a number of otherworldly populations as a whole rather than as individual studies. “We are turning attention away from finding new individual systems toward trying to understand the demographics of these worlds that are most similar to our planet Earth,” said Thompson. In 2009, Kepler began its orbit around the sun with the mission of determining how common planets like our own are in the Milky Way galaxy. The spacecraft conducted its research by looking out for brief blips in brightness resulting from planets crossing between their stars and Earth. Studying the duration and frequency of those blips allowed scientists to better understand how big the planets were and how far from their stars they orbited. During this time, Kepler has found several rocky worlds with regions just right for liquid water to exist on its surface —not too hot and not too cold. With 4,034 candidates, scientists have found almost 50 that are likely rocky and situated near their stars in orbits capable of hosting life. Scientists hope to pick a part those 50 potential worlds over the next year or so in order to nail down a galactic, Earthy census. To view our most recent to latest articles on the UFO/extraterrestrial phenomenon, please click HERE.